Our Funarena! : Naxals Attack Congress Convoy, Kill 28! 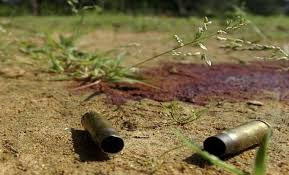 The dreaded Naxals, Maoist extremists, ambushed a Congress convoy last evening in a dense forest area near Bastar in Chhattisgarh state of India and killed 28 including several prominent local Congress leaders. More than 30 were injured including the former Congress Union Minister VC Shukla who is in a critical condition. Around 250 Naxals ambushed a Congress convoy of nearly forty cars that was returning after a rally and attacked them with landmine blasts and rain of bullets. The security in charge of the convoy ran of ammunition while countering the attack. Then the ruthless Maoists surrounded them, took away their mobiles and shot many of them in cold blood. This is the worst Naxal attack of all time in Maoist-infested Chhattisgarh, and follows the recent attack on a Doordarshan transmission center early this month that killed three security personnel. The Naxalism has also been a huge challenge in Gadchiroli district of Maharashtra bordering Chhattisgarh in the east with frequent encounters between Naxals and security forces. The Prime Minister of India Dr. Manmohan Singh and Congress President Sonia Gandhi visited Chhattisgarh today and described this as a heinous attack on democracy. They also appealed to all political parties to sink their differences on this matter of grave concern and put up a united front to tackle the issue. Many leaders of the national opposition BJP condemned the attack and the Chief Minister of the BJP ruled Chhattisgarh assured of all possible steps. Of late the Naxals have been gradually becoming indistinguishable from the terrorists and as the Prime Minister said today this is posing the biggest challenge to the internal security of the country. Although the Naxals are left-oriented and extremely dissatisfied at the present system, they are still citizens of India which makes the policy to deal with them vexed and complicated. Since some terrorist groups inside the country had been invited for talks with the Government we can suggest the same for the Naxals, trying to convince them and bring them to the negotiation table. Repressive violent measures are likely to incite more violence. We condemn this heinous attack against humanity with all our heart and pray for prevention of such attacks in future.